Expect to be delighted, inspired, and amazed when you pay a visit to the Cedarhurst Center for the Arts in Mount Vernon, Illinois. Located on a 90-acre campus on the north side of town, this multi-facility complex of visual and performance art is a regional treasure. Cedarhurst is located just a couple of blocks from Sidwell Friends Bed and Breakfast, which makes an idea base for a visit to Mt. Vernon. The five-star B&B, located in a beautifully updated 1920’s home, exudes an intimate boutique hotel feel with three guest rooms and lots of pampering touches. You can enjoy a delicious home-cooked breakfast in the morning, then just walk over to Cedarhurst Center. The heart of Cedarhurst is the Mitchell Museum, a 33,000 square-foot cultural center housing four galleries, an interactive family center, a performance hall, and the museum gift shop. 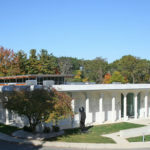 The Permanent Collection Gallery here is a treasure trove of American art, showcasing the private collection of Eleanor and John R. Mitchell, prominent Mt. Vernon residents, as well as other significant works that have been added over the past 40 years. The paintings, works on paper, and sculpture include some of our most accomplished late 19th Century and early 20th Century artists: John Singer Sargent, Mary Cassat, Thomas Eakins, Childe Hassam, and others. The Main Gallery at the Museum is a venue for special exhibits, often featuring Illinois and Missouri artists, as well as national talent. At the Beck Family Center, a hands-on environment encourages children to discover art via interactive aids, including a life-size puzzle and cityscape building blocks. The Shrode Art Center is used both as a classroom and an exhibition hall where the popular annual quilt show is held. Also in the multi-complex is a performance hall, home to an annual Chamber Music Series that runs September through March, and features an impressive lineup of musicians from around the country. 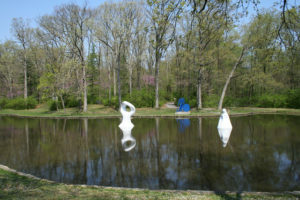 After visiting the museum, be sure to stroll through the extensive Goldman-Kuentz Sculpture Park, which features more than 70 large-scale contemporary pieces and is considered one of the top such displays in the Midwest. Cedarhurst Center for the Arts offers free docent led tours for small and large groups—just be sure to schedule them ahead of time. From Memorial Day to Labor Day, the center remains open late on Thursdays for After touring, visitors can relax on the back patio and listen to live music and enjoy food from local concessions. The center also offers special events throughout the year. A highlight in September is the Cedarhurst Art and Craft Fair, a three day juried fair featuring more than 100 artists. Two upcoming events this Spring include a Mother’s Day Brunch on Sunday, May 14, 2017 (tickets are currently available on the Cedarhurst website); and Night at the Museum, an after-hours fun-filled event for kids on June 9, 2017. Check the museum’s website for details on these and other events. 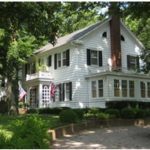 Thursdays, Memorial Day – Labor Day, 10:00 a.m. – 8:00 p.m.
Sidwell Friends Bed and Breakfast is a member of the Illinois Bed and Breakfast Association. Expect a wonderful stay at any of our member inns! MUSEUM IMAGES COURTESY OF CEDARHURST CENTER FOR THE ARTS. This entry was posted in Art and Music, Illinois Bed and Breakfasts, Museums and tagged Art galleries, Mt. Vernon by admin. Bookmark the permalink.